Photo courtesy of Real Sliding HardwareBarn doors take up less room than many other types of doors since they are nearly flush with the wall. Barn doors become a design statement and can be a major "art" piece in a room. All one needs is a bit of imagination to make this type of door their own. There was a great deal of interest in a barn door on a house in East Hampton that was shown in an earlier blog. Barn doors have become increasingly popular on the exterior as well as the interior of homes. They can be bought as antiques, salvaged from old barns or houses, built easily by handy do-it-yourselfers, or can be purchased new. Barn doors can be used in pairs or individually and hang from a bar with rollers or coasters at the top, that move the door along a rail. Often there is also a rail or guide at the bottom, but some doors do not have that guide and hang one or more inches above the floor. These doors are generally used more for their decorative nature than their functionality. They can be painted white or be glass and look very contemporary or can have cross molding, be left in their natural wood state and look very rustic. Barn doors are often painted a contrasting color and become a major decorative element in the room. They can be used to close off rooms, hide television sets, as closet doors, divide a room or on the exterior of the house. Barn doors take up less room than many other types of doors since they are nearly flush with the wall. They can be used in tight spaces where swinging doors would not be possible. A barn door on the exterior of the Laurel Hollow House in East Hampton is decorative but also functional in inclement weather. Interior sliding barn doors separate the kitchen from the dining room in the Laurel Hollow House. A salvaged door was a creative solution in this area of the house where a pocket or swinging door would have been awkward. This large barn door is suspended over the stairwell to open up to the master bedroom and rooftop patio. The authentic looking barn door was used to divide the hallway between the master bedroom and bath. 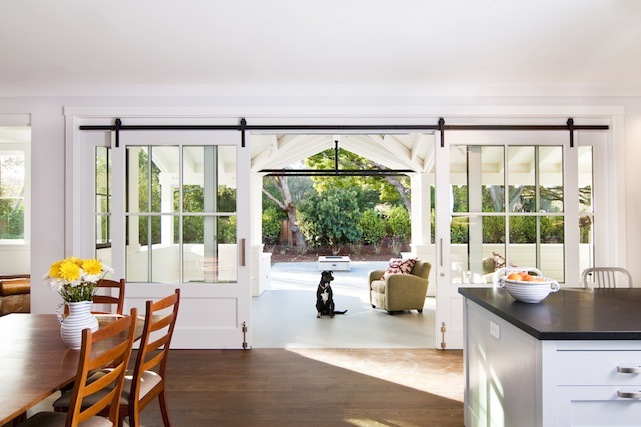 These large barn doors open the kitchen to the large covered patio beyond. The pantry in the kitchen can be concealed with this modern take on a barn door. This rustic pair of barn doors are used to enter the garage from the garden. A barn door is used here as a closet door in this small space. This massive barn door serves as a room divider between the kitchen and media room. A barn door can be used to hide a washer/dryer. This salvaged door is used to close off the laundry room. A custom door barn door was built with integrated blinds to control the light coming into the house. This custom barn door includes a blackboard for leaving notes and opens up a storage closet. The small barn door hides a flat screen television in this living room. Opaque glass panels were included in this barn door entrance to the bathroom. This reclaimed rustic door adds a splash of color and authenticity to this country house. These double doors open the entrance way to the living area of the house. Customized barn hardware and doors can be bought from a variety of suppliers, such as Real Sliding Hardware, NW Artisan Hardware, Rolling Door Designs and Rustica Hardware. Or the hardware can be bought more economically at large hardware stores, such as Lowe's and constructed by do-it-yourselfers using standard hardware that is readily available. There are several websites on the internet that give excellent instructions on building a barn door, such as the one at the diy Network. Sometimes authentic old barn doors are restored or doors from other houses are re-purposed as barn doors for homeowners next home.